All‑time great Manny Pacquiao cruised to a comfortable unanimous decision over Adrien “The Problem” Broner to defend his WBA ‘regular’ welterweight world championship. 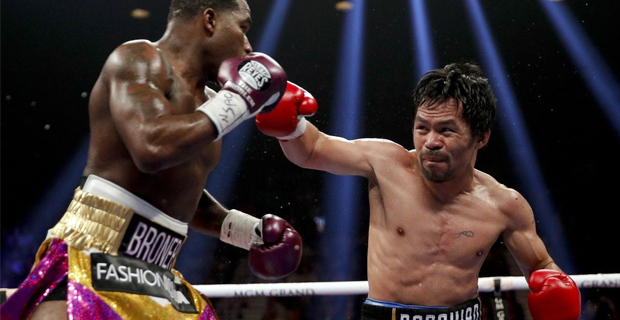 Pacquiao defeated Broner in front of a sold‑out MGM Grand Garden Arena in Las Vegas. The global icon and boxing’s only eight‑division champion Pacquaio who was fighting for the first time as a 40‑year‑old, and the first time in the United States in more than two years used effective jabs and sustained body work in his 70th professional fight that was watched by an announced attendance of 13,025 fans, including the retired Floyd Mayweather. Following the win, Pacquiao says that he is again proving that the Manny Pacquiao journey will still continue. Meanwhile when asked by SHOWTIME’s Jim Gray if he would like to rematch Floyd Mayweather in the future, Pacquiao said he’d do it if Mayweather came out of reitrement.